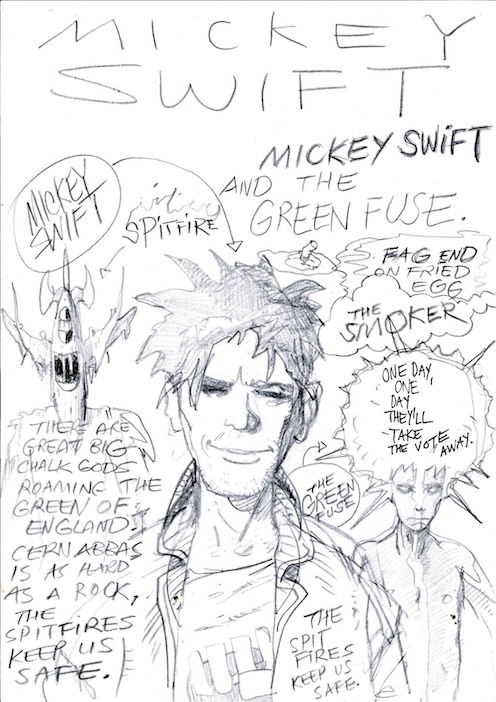 I had a few pieces from Brendan McCarthy arrive recently; nothing 2000AD-related among them* but Brendan did throw in this recent Mickey Swift drawing, which was nice. Some nice dark inking by The Stapler. Picked this fine Jaegir piece up from Simon Coleby at the 40th bash. So good it even made the stoic G. Rennie burst into tears of joy* when he signed it for me. That's a great page. I'm a fan of everything Mr Coleby does, but his Jaegir work is absolutely outstanding. Yes, I have always loved Simon Coleby's stuff- it was a pleasure to meet the man. I quite enjoy 'process artwork' and snapped up a few Mark Harrison Ten-Seconders pages a while back, still great, even without his digital magic. Somethin for the ol sweet tooth. The Coleby droid really does produce some stunning work for Jaegir. A page by him is essential in any tooth art collection, I'd have thought. Thank Grud, for the 40th bash, eh? Thank Grud, for the 40th bash, eh? Indeed. I was on a strict budget though, walked away from so many potential purchases it physically hurt. Anyway, Colin's recent enjoyable wittering on 90's Slaine reminded me that I have a few pages of pencils from The name of the Sword. Really nice stuff from a young Greg Staples. This one works better with the blacks painted in!